TRAVIS PATERSON Oct. 25, 2017 6:30 a.m.
hold the yellow pump Ocean Rodeo currently sells, the silver-coloured winch pump that they’ve created, and the innovative air bag that goes with it. 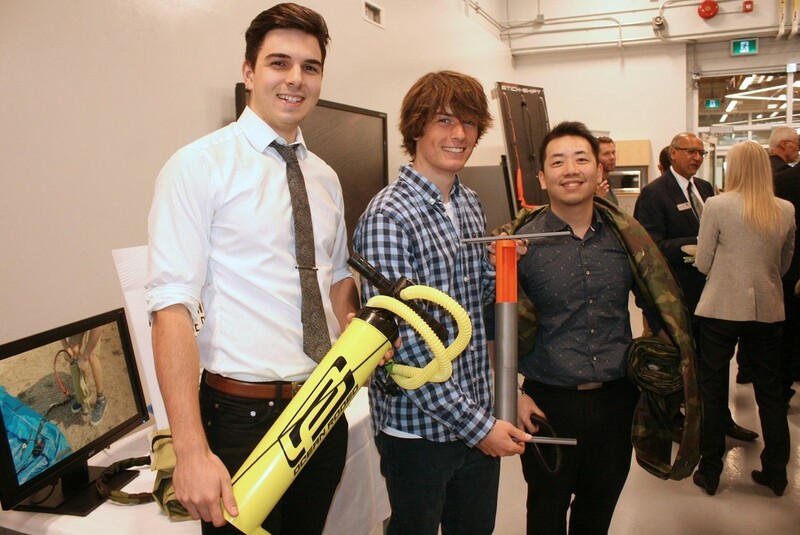 The trio of Camosun mechanical engineering grads showed off the invention during the launch of the Babcock Canada Interaction Lab at Camosun College’s Interurban campus. (they are like two sails sewn together and inflate for stability, and buoyancy in the water). The trio came up with a small eight-PSI winch pump that takes up as less room than a reusable water bottle. To fill a 140-PSI kite they also instituted an intermediary airbag that they fill up first, and then use the winch pump to force air into the kite. The patented winch pump also converts into a traditional pump, and the result is a combination that can fill a kite in a matter of minutes.